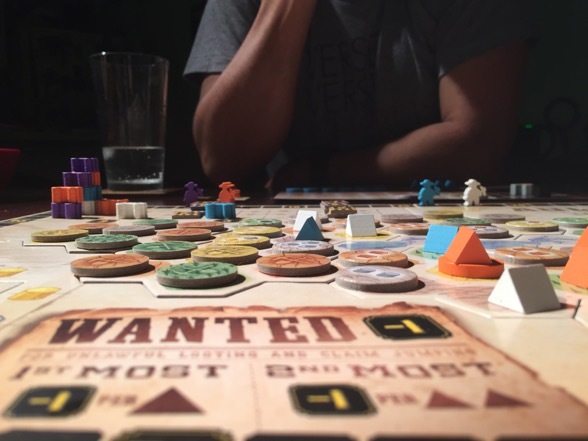 Gold West is actually a very curious game. It moves quickly — quicker than one might expect. They don’t call it a gold rush for nothing. At two and three player counts, the game can wrap up in an hour (or perhaps slightly longer). With four people around the board, the playtime extends into the ninety-minute range, moving briskly all the while. It’s fast and light, like most Californian experiences, but not without substance. In fact, there’s an impressive amount of strategy to contend with, especially given how simple the rules are. 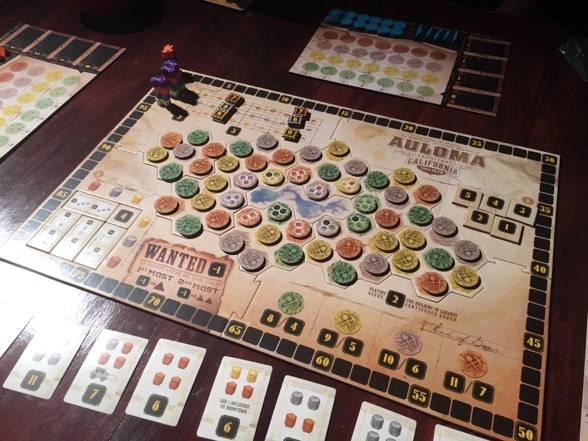 The scenic landscape of Auloma, CA, set up for a two player game. 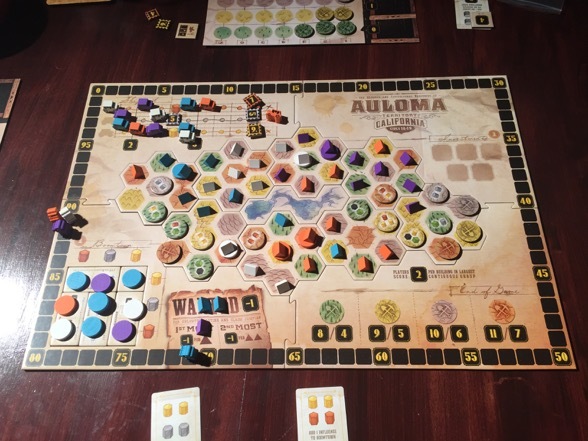 With three or four players, the Auloma region grows considerably. Generally speaking, players do three things per turn. They activate a mine shaft to generate raw materials (read: gold, silver, copper, wood, and stone). They then use any metals from their haul to earn points. This may involve trading money for influence in “Boomtown,” which is essentially an area of the board that doles out bonuses for various achievements at the end of the game. Players may also ship their metals off on a stagecoach, which can lead to a surprisingly lucrative source of bonus points throughout the game. Lastly, metals can fulfill various contracts (known as “investments”) which also provide points and occasional special powers. These contracts are available to everyone, and competition for them can be fierce. More often than not, I’ve heard players make audible noises (usually a moan and occasionally some cussing — how very Wild West) when someone else nabs the contract they’ve been working towards. Once a player has finished all their metal activity, they then move on to their third major action: building! …Or not building. 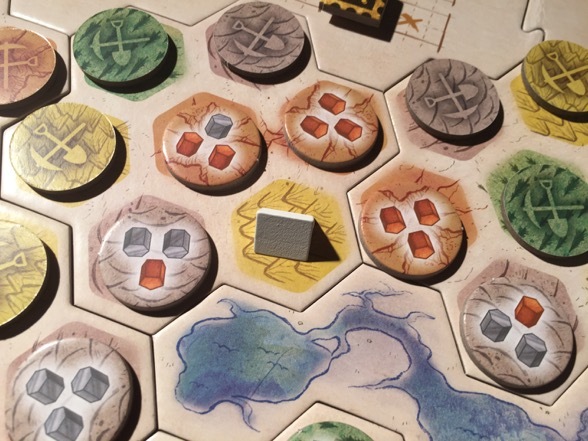 With stone or wood (or sometimes both), players erect buildings, placing a little tent-like piece in the center of the board and gaining resources in the process. Should a player not have the materials to build, then he or she will be considered a looter, subsequently falling victim to point losses and general mockery from the table. But the upside is that they still get to collect resources, and everyone — looters and law-abiding prospectors alike – puts their shiny new gold or copper or stones or WHATEVER into their mine shafts where they will be plundered anew on a future turn. An example of everyone’s personal player board. The triangles represent camps, and the circles represent influence. Put a camp and influence together, and voila! You’ve got a settlement — perfect for all your settlement needs. But of course, this is a modern board game, which means there’s a bit of trickiness to all this. When I say that players activate their mine shafts, it’s not as simple as plucking cubes from their personal player boards (on which the aforementioned mine shafts are located). 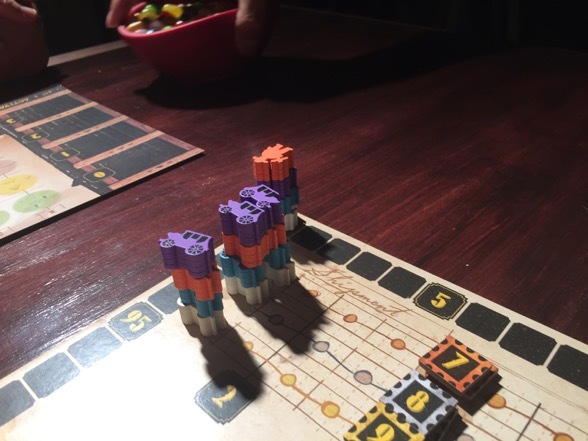 No, the shafts are divided into bins, and in order to plunder these glorious goods, players must grab all the resources of one bin and move them out of the mine, dropping one single resource in each other bin along above it along the way. Think of it as an elevator dropping off one person on each floor en route to the roof. Except, in this case, the building is the mine shaft, the people are resources, and the elevator is your hand. Some sweet, sweet resources rest in the mine shaft, waiting to emerge. 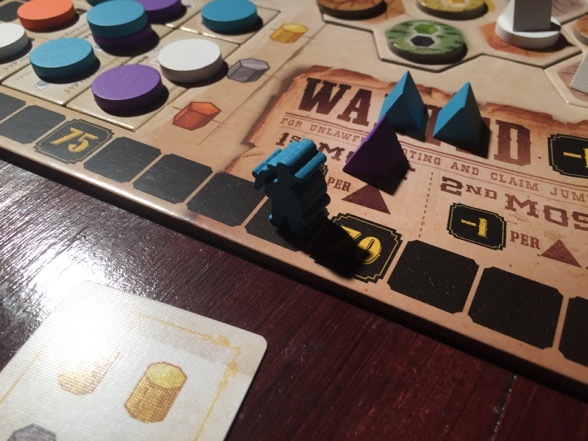 This mancala-esque mechanism leads to some of the most fascinating and challenging decisions in Gold West. That’s because after having received resources at the end of a turn (from building or looting), players must place the cubes in a bin in the mine shaft. 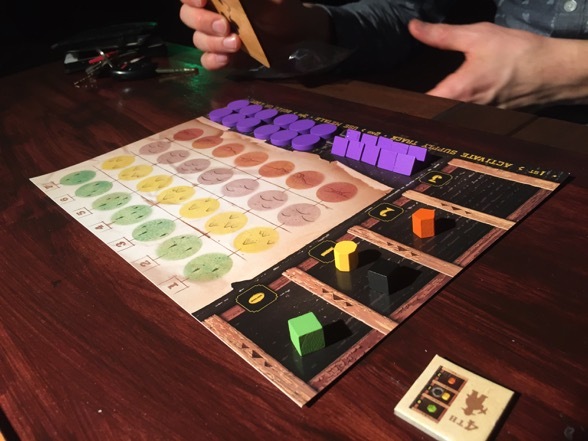 Complicating matters is that players earn bonus points for placing resources deeper in the mine, which means they’ll be harder to extract using that nefarious mancala action. It’s not enough to simply hoard resources. You have to time their availability just right. One wrong move, and you’ll have wasted three turns. Or worse: you’ll find yourself looting. They come from little circle tiles, which are meant to represent terrain. These circles are strewn across the board and come in a variety of colors: yellow, green, brown, and gray. At the beginning of the game, nearly all these terrain pieces are face down; however, players will slowly turn them over, revealing precious resources on their underbellies. It is only then that the terrain is available for development. 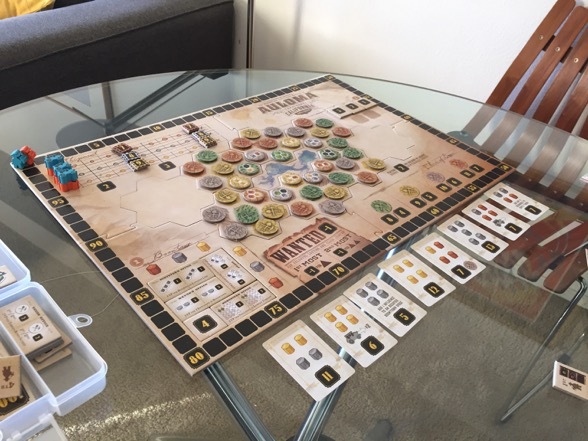 When players build their camps or settlements, they do so on these face-up tiles, gaining the resources printed on them in the process. One of my charming camps, with riverfront views and easy access to all the silver and copper a prospector could dream of. Additionally, players keep the terrain tile and add it to their personal tableau. This is essential because at the end of the game, whoever has the most of each terrain type gets bonus points. That could mean up to eleven points should you find yourself with more copper terrain than anyone else for instance. Unfortunately, looters don’t get to claim a terrain tile (they ARE criminals, after all), and thus they imperil their end-game scoring majorities. Those who are diligent with their resources, however, may find themselves able to build not just camps but settlements, which provide critical boosts in these terrain majorities. I won’t get into the nitty gritty of it all, but settlements are really good, and looting is really bad. Looters get sent to the Wanted box where their permanent records are forever TAINTED. Sometimes it’s worth looting if it means pushing out enough metals to claim an investment contract before someone else. Hey, that’s an extra eleven points on your score! And that’s eleven points that you just stole from your opponent! Plus, did I mention there’s a bonus for being one of the first people to nab a contract? Yes, there are bonuses everywhere in this game, and they absolutely push and pull players in all directions (in the best way). I haven’t even discussed the end game bonus of two points per building in each player’s largest contiguous group of structures. 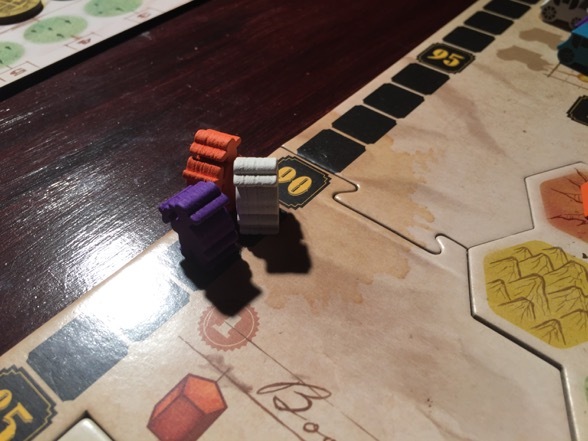 I want to build on the gold terrain because I need three gold in order to set myself up to take an eleven point contract. However, I need the silver terrain because then I can take the lead in the silver terrain race. But neither the silver or the gold provide building materials, and I need them otherwise I have to loot next turn. So, I could instead build in the forest terrain and get three pieces of wood, but then I’m not adding onto my contiguous group of buildings, and I need that for end game scoring. Oh wait, there’s a stone on that copper tile, but then if my opponent grabs the three gold that I was originally looking at, they may grab the shipping bonus before I do. And what about my Boomtown bonus? That’s what it’s like EVERY TURN. 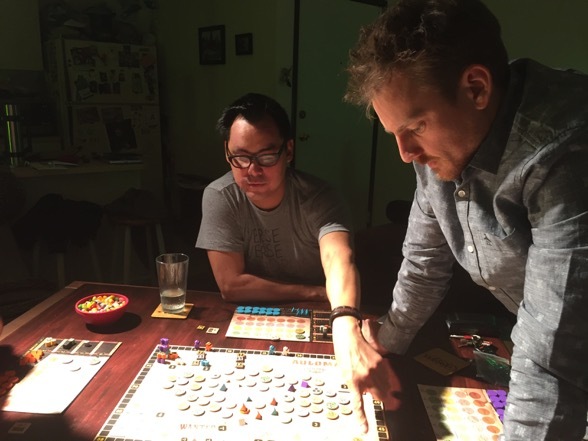 Brendon and Alex weigh the mighty decisions of Gold West. Not even a bowl of Jelly Bellies can break the tension. And yet, it’s not paralyzing. These are fun decisions, not weighty ones. There are always points to be had, but the key is to have them in the smartest way possible. Figuring out what goes in the mine and where it comes from and where it goes is a delightful puzzle. 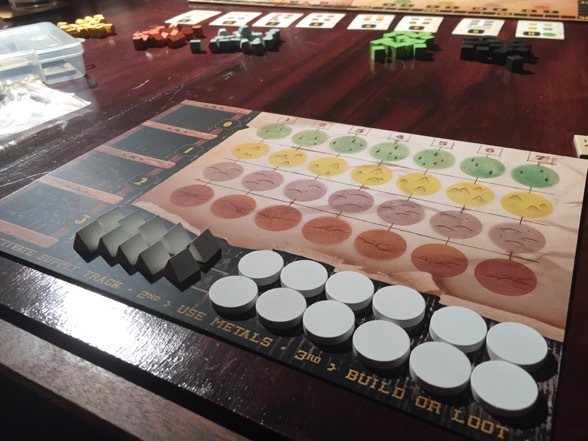 Adding to the experience is a modular board that has a highly variable setup. The terrain layout is always different, and so are many of the bonuses. In fact, only a small portion of the Boomtown bonuses and investment cards come out every game. Replayability is high, and we like that. Interaction is also great. Players aren’t simply stuck face down in their mine shafts. They’re jockeying for position in the middle of the board. Sometimes they go on the offense and break up people’s building clusters. Other times they’re trying to simply escape an opponent’s bottleneck. This isn’t intense Terra Mystica area control, but it’s just enough to keep things engaging. Plus, between the bonuses and resource tiles, there are many hotly contested items to keep everyone all up in er’rbody’s business. As for components, they’re largely fine; however, the scoring track and the stagecoach/shipping area are entirely too small. There’s no room for the little player pieces to co-exist, even if they’re stacked flat. I simply don’t see why the board wasn’t made half an inch larger all around to accommodate a better scoring track. And that shipping route — it’s crammed up into the corner, despite plenty of room that goes unused elsewhere on the board. It’s flat-out annoying. Not a prohibitive issue, but such a fixable one that it’s a bit confusing as to how these flaws snuck through the design process. Towers of pieces teeter oddly in the corner. If there’s any significant drawback to Gold West, it’s that the theme feels very pasted on. I’m not someone who lives and dies by a game’s theme (or lack thereof), but in this case, the theme is very thin, and as a result Gold West sometimes feels… cold? Forgettable? Don’t get me wrong — it’s a really fun and smart game that fires on so many cylinders — more than one might expect considering its perceived lightness — but it never quite captures the imagination. Games end, and players nods calmly, quietly reviewing their strategies. They let out succinct, high pitch praise: “It was fun.” or “I liked it.” They’re surprised at how good the game is, but no one raves. No one clamors to play again immediately. I don’t know what’s missing. I blame it on the thin theme, but honestly, I’ve played games with thinner themes that have won over the table. And to be fair, I’ve played games with wonderful themes that quickly have worn out their welcome. 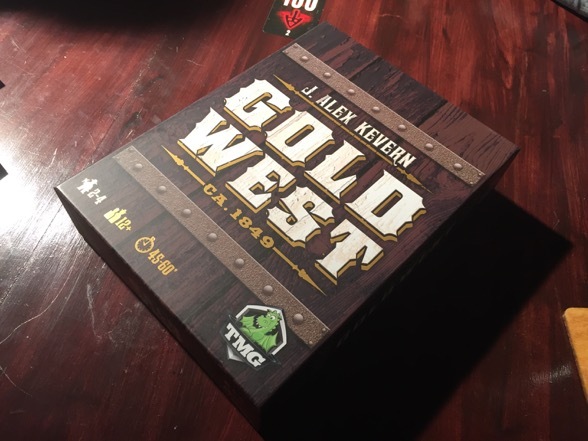 This is not to say that Gold West isn’t a worthy game. It just might be a slow build. I’ve found that I’ve enjoyed it more and more with each play, and at a full player count of four, the game really does shine. Plus, one cannot overlook its playing time, which may be one of Gold West’s strongest virtues. It’s practically a filler game in terms of length, but it makes the mental demands of a full-length brain burner. In other words: it’s one potent game of strategy! I’m not mad at it. In fact, the more I write about the game, the more I really like it. It may not be a mainstay of game night, but it’ll definitely be a perfect option when there’s an hour to kill. And I have many hours to kill! The board at the end of the game is littered with camps and settlements; Boomtown is overrun with influence tokens; and almost all the investment contracts are gone. And look: three instances of looting, led by resident outlaw Brendon. How regretful for him. The final score: I tied with Aaron, the orange player, for 1st place (tying on every tie-breaker to the point where the instructions simply suggested we play again). Alex landed just behind us by one point, and the ever unlawful Brendon was long forgotten around the bend, ironically stuck next to reminders of his earlier illegal activities. It’s actually pretty crazy — and a credit to the game’s balance — that we had such a photo finish. 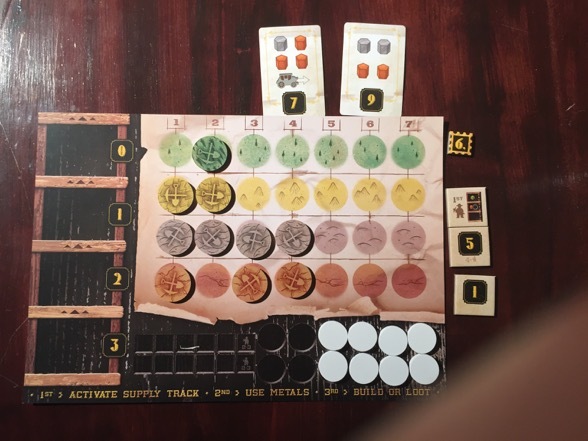 My player board at the end of the game: my mine shaft is empty — like my soul, at times — but I have strong influence in copper and silver terrains, as indicated by my collection of tiles. The gap in the copper track indicates the presence of a settlement instead of a regular camp. That one-tile boost in influence was enough to win me the copper race and subsequently eleven points. Every little move counts! Do you have Gold West? Have you played it? What do you think about the game? 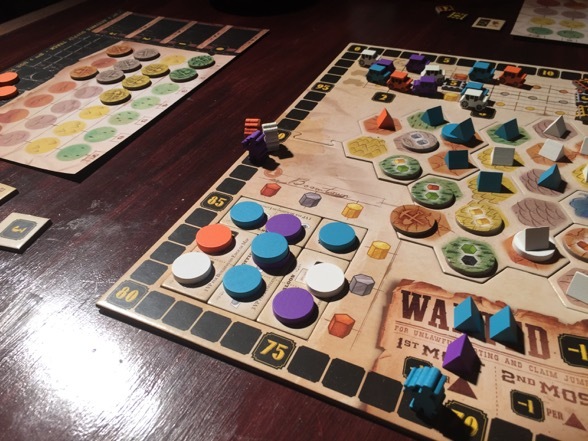 This entry was posted in Games, Reviews and tagged Adventures in Game Time, board games, games, Gold West, Tasty Minstrel Games by Ben Mandelker. Bookmark the permalink.